Modernizing the legacy of Standard & Poor’s through a digitally led brand transformation. How do you create a new digital ecosystem that confidently marks S&P Global as the leader in delivering essential financial intelligence to the international capital and commodity markets? Digital Voice: We united the brand’s divisions and offerings under the singular focus of providing “essential intelligence” and extended that framework to the design and content hierarchy. 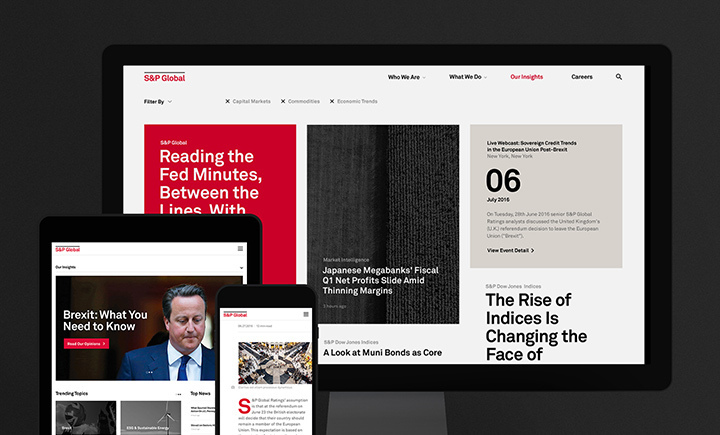 Content Feed: We devised a new content approach to aggregate the best articles across all of S&P Global’s divisions so they can inform critical conversations and decisions impacting the global economy. We told the story of what S&P Global does through a powerful motion graphics piece and worked with stakeholders across the company to construct a simple, compelling expression of S&P Global’s capabilities. Simplified User Experience: We condensed pages, rethought menu designs and restructured the way content is presented to arrive at a site experience that’s seamless and simplified, mirroring the brand’s roots in the essential. S&P Global, the leading provider of transparent and independent ratings, benchmarks, analytics and data, needed to unite its cross-division functionality and content under one digital platform to better enable users to make their financial decisions with conviction. 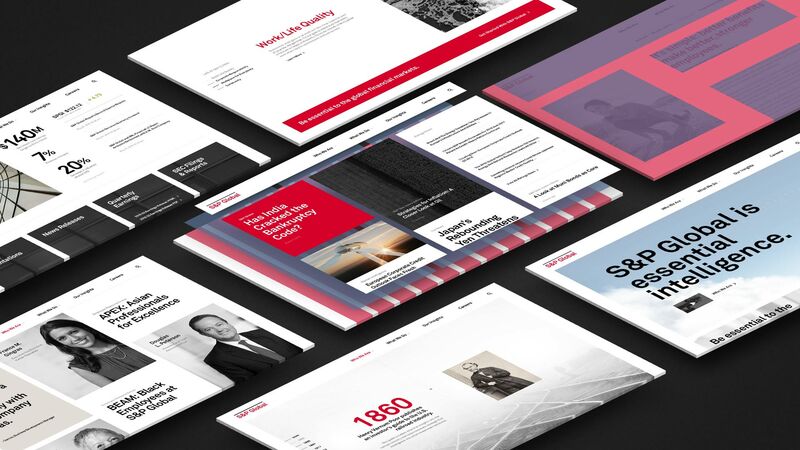 Firstborn was asked to show the power of S&P Global’s capabilities and brand by creating a unified digital experience that would represent the company’s many complex offerings under the singular focus of providing essential intelligence to companies, governments and individuals. S&P Global’s existing content ecosystem was fragmented, so we performed a comprehensive content audit of all properties within the existing digital ecosystem, evaluating thousands of pieces of content from various sites against brand/quality guidelines. Once we devised a new content hierarchy, we added a dedicated “Insights” section to the site, where the brand could share the vast amount of intellectual capital that its world-renowned experts produce every day. 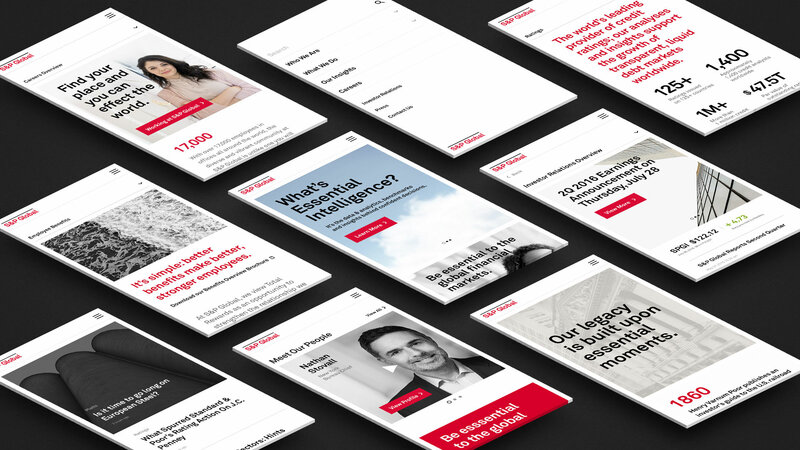 Using the brand’s new voice and positioning, we worked to establish S&P Global as a thought leader across financial markets. This Insights section now aggregates the best content across the entirety of the brand’s divisions and products. We also extended the brand’s “Essential Intelligence” positioning to define how we communicated on each page of the site. We simplified the navigation in order to focus users on what matters most. From there, we defined a minimal and considered visual system that works across all of S&P Global’s divisions. Our goal was to make sure each division felt like one part of a cohesive whole that worked together to deliver the intelligence people need every day. 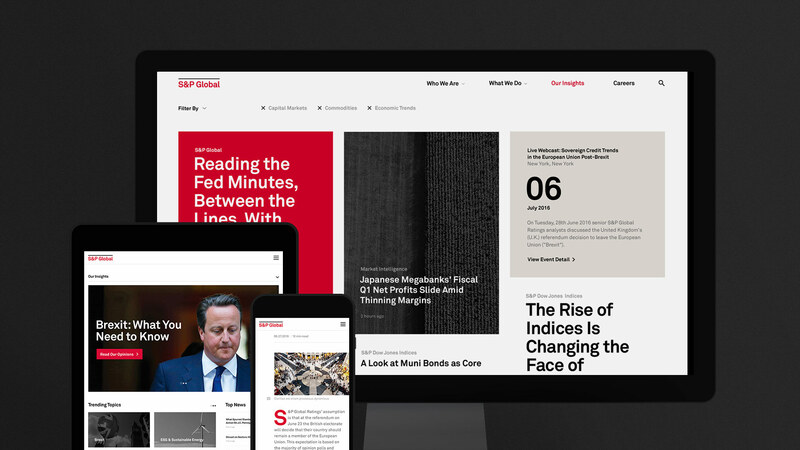 We armed S&P Global with a digital experience that reflects and strengthens the brand’s leadership in the industry. We created a future-facing blueprint for the consolidation of their brand and product ecosystem, so that the insights gleaned by the effectiveness of this redesign can inform future optimizations of other products and divisions.